This new, detailed global mosaic color map of Pluto is based on a series of three color filter images obtained by the Ralph/Multispectral Visual Imaging Camera aboard New Horizons during the NASA spacecraft's close flyby of Pluto in July 2015. 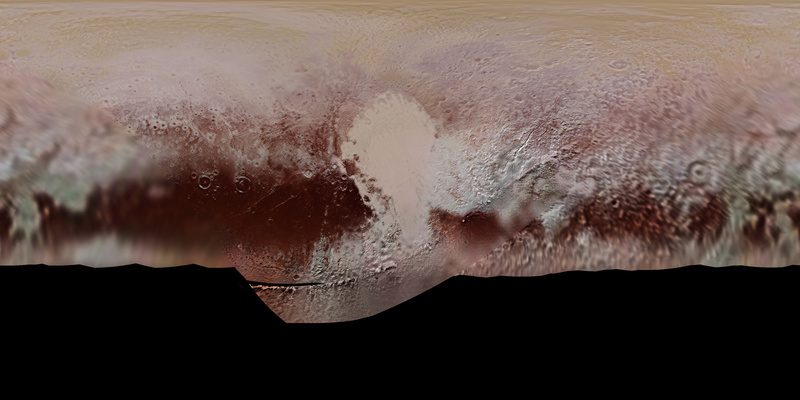 The mosaic shows how Pluto's large-scale color patterns extend beyond the hemisphere facing New Horizons at closest approach- which were imaged at the highest resolution. North is up; Pluto's equator roughly bisects the band of dark red terrains running across the lower third of the map. Pluto's giant, informally named Sputnik Planitia glacier - the left half of Pluto's signature "heart" feature - is at the center of this map.